Condition is very good / very good plus. Condition scale is poor - fair - good - very good - excellent. Program is in very good condition. 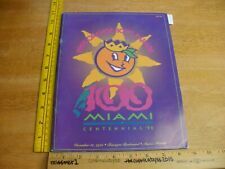 This is a great program from the parade that included floats from 1995. Fantastic Pieces. Two date to around 1915 and three date to around the 1940s-50s. By all accounts, the Orwell club has exceeded those noble targets by a wide margin. 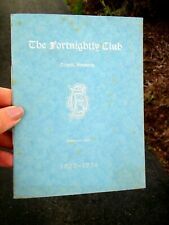 The Fortnightly Club. Orwell, Vermont. If it does not say new or mint condition, then it is not new. Inside ages are better. The front cover features the French music hall star and actress Mlle. Spinelly (Andrée Spinelly). The program also lists Charles Gesmar as custom designer. This program has small photos of many of the actors and actresses appearing at the Casino de Paris. Souvenir Program Holiday on Ice 1963 Morris Chalfen w Ticket Stubs & Clipping! Souvenir Program Holiday on Ice 1963 Morris Chalfen w Ticket Stubs & Clipping neatly stapled to back of cover as shown. In really nice condition throughout, this was found in an estate basement and does have some basement smell. Condition is Used. Shipped with USPS Media Mail. Hello. I took many closeups so you can see the condition. I highlight all issue areas when present. Please use the pictures as your guide for condition. I will combine shipping wherever possible and usually will ship any other similar items for free after paying for the first shipping rate unless the weight and/or size drastically changes the shipping price. Please wait for an invoice on combined shipping for a reduction. I will be using tracking so you can always see where your item is during transit. I pack quickly and securely. Please use the pictures to judge the condition for yourself. Thanks for looking. This is “Magic Kingdom on Ice: Pinocchio,” a previously-owned souvenir program published by Ice Follies in 1987. It is in very good shape with general wear and measures 13" x 10½”… This edition of Disney's figure skating show was an adaptation of the animated film “Pinocchio.” It has full page color pictures of the various performers and bios of major cast member, skaters, and creative directors. Skaters here inside include Olympic medalist Linda Fratianne, J. Scott Driscoll, Karl Jurtz, Jane Alioto, Toyka Roal, Eric Kerr, and comedy stunt skaters the Jackpots. Richford is a Vermont town. THE 40 PAGE PROGRAM IS IN GOOD CONDITION. 1942 Sixth Annual Dinner Dance Universal City Club Program. Year book format showing photos and service branch of the Universal Studios employees serving their country. Produced by Universal studios. SIZE IS APPROX. X 10 1/2 IN. This old program booklet is a paperback in fair condition with slight edge and corner cover wear. all the 28 pages are tight, colorful and clean. this old program booklet has photos and information on the band QUEEN along with tour dates. PRINCE HALL, STANSTEAD, QUEBEC, JUNE 6, 1919. DARTMOUTH JUNIOR PROM,CLASS OF 1916,PROGRAM OF EVENTS. RESIDUE,PRINT LOSS. HAS WEAR,CREASING,SLIGHT SOILING. REAR COVER HAS SCRAPBOOK. Skating Vanities of 1946. good used condition with light normal wear. Program of Delphic Festival 1930. ΔΕΛΦΙΚΕΣ ΕΟΡΤΕΣ – FETES DE DELPHES 1930, Πρόγραμμα των Δελφικών Εορτών Μαΐου 1-3, 6-8, 11-13, 1930, (11,5Χ24,5 εκ) τρίπτυχο. Δίγλωσσο Ελληνικά – Γαλλικά. Good condition (check the pictures for exact condition). Program is 17 pages, and is in very good condition. Dominican Republic 1954 Graduation Program Liceo Gaston Deligne, in S.P.M. GRADUATION PROGRAM DEDICATED TO "GENERALISIMO DOCTOR RAFAEL LEONIDAS TRUJILLO Y MOLINA, DOÑA MARIA MARTINEZ DE TRUJILLO, GRAL. HECTOR B. TRUJILLO Y MOLINA. Cover color: Light blue. Pages: Bone white heavy paper. Program is from 1979 and has no ripped or missing pages. Perfect for any celebrity collector! Folded but otherwise good condition. Also included is a 4" x 9" bi-fold flier and an unused 3" x 3" temporary tattoo (on card), all featuring Escher's 1969 work,Snakes. Tri-fold (23" x 9", unfolded) program from the exhibit,Virtual Worlds: M.C. Escher and Paradox, which ran at the. A colorful 4 page souvenir program / mailer from the Folies Bergere as presented at the Tropicana Hotel in Las Vegas, Nevada in 1961. In very good condition. Measures about 7" x 11' when closed. DATE - December 9, 1943. FORMAT - Stapled booklet. 1974 Ringling Bros. & Barnum & Baily Circus Program and Magazine (104th Edition of the Greatest Show on Earth). Full color souvenir program. There is a signature that is possibly "Ronald McDonald" or "Roald McDanall" on the title page under a Ticketron envelope that is attached to the page by a circus sticker. Mr. Owens was the secretary of the Caxton Club, and was on the Program Committee. He was also an advertising executive for R. R. Donnelley & Sons as well as the author of "The Scandalous Adventures of Reynard the Fox" and "Doctor Faustus a Play Based Upon Old German Puppet Versions". It is in the French language of course. REVEREND GEORGE HAZELTON SPENCER. VILLAGE HALL,BRADFORD.